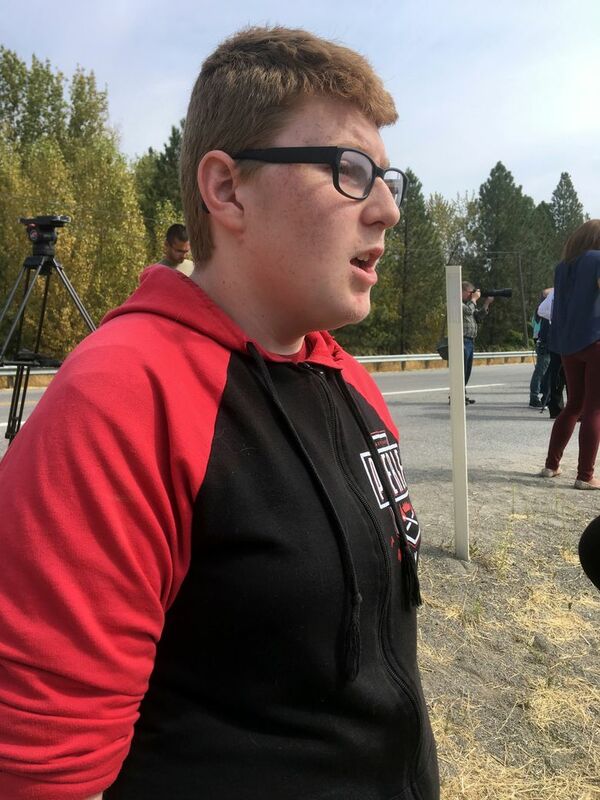 The shooting suspect at Freeman High, south of Spokane, had warned weeks ago that he planned to do “something stupid.” His fellow students at the school describe what happened next. Just after 10 a.m. Wednesday, his promise was kept and a community was left with a dead son, daughters in the care of trauma surgeons and scores of others grappling with the tough questions that inevitably follow school shootings. Before the violence was over, one student, Sam Strahan, was dead. Three others — Emma Nees, Jordyn Goldsmith and Gracie Jensen — also were shot. By early Wednesday afternoon all were with their families and listed in satisfactory condition at Providence Sacred Heart Medical Center. The accused boy with the deadly promise was Caleb Sharpe, a sophomore with a shoddily shaved head who brought a semi-automatic rifle and handgun to Freeman High School south of Spokane. The carnage was cut short by a jammed gun and a school custodian who tackled and disarmed him. By the time law-enforcement officers arrived at the school, Sharpe was immobile. And by the time most of Spokane had heard about the events at Freeman, he was in the back seat of a patrol car. The violence was swift, and brought to a rapid conclusion. It began and ended in the hallway outside of the biology room on the school’s second floor just before first period. It was a “late start” day and students were heading to class, putting backpacks in lockers and readying for class. Liam Marshall, 15, had arrived to English class. On the bus with Sharpe, he’d noticed the duffel bag Sharpe carried. When Marshall heard the first shot, he didn’t immediately think back to that morning’s bus ride. But the shots kept coming, first stoking confusion, then driving chaos. Even without seeing the boy with a firearm, the students heard the growing chorus of gunshots and screams, and the noises that at first baffled the teenagers came into nightmarish focus: One of their own had a gun and was shooting their classmates. Students scrambled, classrooms were locked down. Sharpe allegedly first lifted an AR-15 rifle from his duffel, but it jammed. He quickly moved to his next weapon, a handgun, and found Strahan. Accounts differ, but Sharpe may have shot into the ceiling, and Strahan may have tried to intervene. In the end, Sharpe allegedly shot Strahan in the head. Sharpe didn’t kill anyone else, but not for lack of intent. As he moved down the hallway, gun in hand, he continued to fire. Elliette Clark, 16, was in her math classroom when she heard gunshots in the hall. She peeked out and saw Sharpe firing the gun in a side grip position — as if he were a gangster, she said, and this was a movie — each of the four or five shots punctuated by the flash of the muzzle. She slammed the door. “You could hear them screaming and crying in the hallway,” she said. Once the door closed, she said the screams grew louder because the girls were left in the hall. Elisa Vigil, 14, was near Sharpe as he brandished his guns. Ian Moser, 14, was at his locker when he heard three shots. “Everyone was yelling, ‘Gun, gun, gun,’ ” Moser said. A girl just 15 feet away from him was shot, he said. Moser ran, fleeing to the bus barn across Jackson Road, and hid with others. The students fled so quickly, the path remained strewn with their notebooks hours later. Barratt Moland, 15, had just stepped into math class when the shots began. He dropped to the floor and ducked beneath a desk. Students rushed into the classroom, including Emma Nees. Nees was bleeding. She told everyone in the room that she had only been grazed, but a teacher, Marty Jessett, saw two wounds on the freshman’s lower abdomen, where the bullet had entered and left her body. He grabbed some athletic tape and marked both with an X.
Moland said he’s known Strahan and Sharpe for several years, and he believed the two were friends. “I thought they hung out like every weekend,” Moland said. But other students suggested the Sharpe and Strahan had a falling-out recently. In the hallway, the scene remained chaotic. Then abruptly, Sharpe’s path was cut short. The school custodian, Joe Bowen, tackled Sharpe and stripped him of his weapon. With the shooter immobilized, a teacher, John Hays, ran out and applied pressure to Strahan’s head wound. 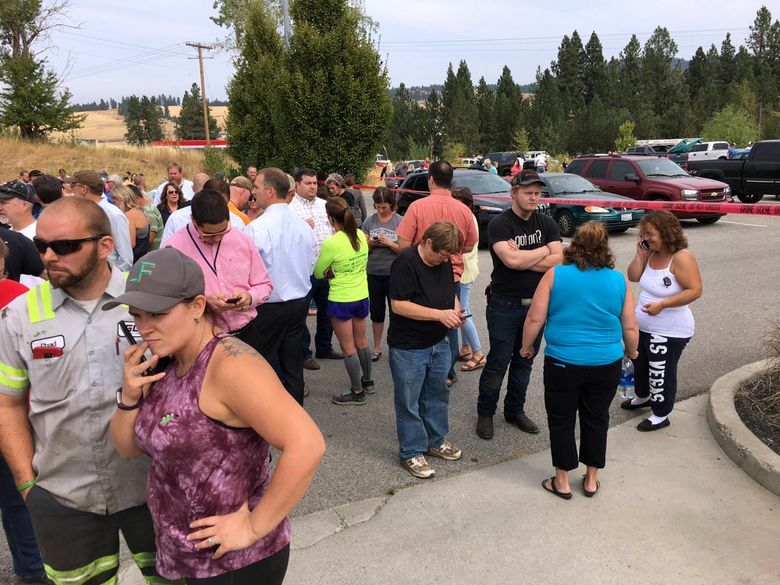 Emergency responders were dispatched at 10:11 a.m., and sheriff’s deputies, along with medical personnel and other local, state and federal law-enforcement officers, rushed to the school. At 10:57 a.m., the first ambulance arrived at Sacred Heart, which had begun preparing for the worst less than an hour before. Eight surgery suites and several trauma rooms were reserved and the hospital’s trauma unit was set into motion. By 11:10 a.m., two of the injured girls had arrived at the hospital, and the third was on her way. The hospital was “all hands on deck,” said Dr. Jeff Collins, the hospital’s chief physician. Friends and family of the girls began arriving at the emergency room, stricken and allowed to park where, normally, no cars go. Hospital security and local police began directing traffic. Just before noon, the girls were listed in stable, satisfactory condition. At the school, students called their parents or sent out dispatches on social media as soon as the shooting started. Distraught parents raced to the cluster of buildings that are Freeman’s elementary, middle and high schools when reports of the shooting first surfaced. Among them were Rondielle and Chris Frye. Chris Frye drove to the scene as quickly as he could. At the school, parents clustered, waiting for a word. A child was dead, but no one knew whose child it was. Knezovich came over and told them what he could, that at some point they’d let kids go 10 at a time and the ones who witnessed the shooting would go last. Within 30 minutes of the shooting, students began evacuating from the building. School officials and sheriff’s deputies called their names, counted their heads and led them, single file, to the football field. They sat there for some time, some in the bleachers, some waiting to rejoin their parents across the street. And some, on the way out, were led past Strahan’s body, which was covered with a blanket, lying in the hallway.